Sometimes I weep when I read what is written in our newspapers and the lack of critical thinking in Zambia. Sometime back the Chamber of Mines got together with the Government and released an "independent report" done by ICMM called 'Enhancing mining's contribution to the Zambian economy and society'. For those who don't ICMM, it's full title is the International Council on Mining and Metals . It was formed in 2001 "to represent the world's leading companies in the mining and metals industry and to advance their commitment to sustainable development". So let us get this right. The Chamber of Mines, which is effectively the mines, gets together with Government run by PF, which I am sure gets significant campaign finance money from mining companies. There's no campaign finance regulation in Zambia, so we can never know for sure. What we do know is that some of PF's influential members allegedly have significant shares in mining companies. They then get ICCM a mining body to do a report about mining. Surprise, surprise! The report concludes that mining taxes contribute around 32% to total government tax revenue. At this point everyone gets excited and the talk of higher mining taxation dies down. What they forgot to tell you of course is what they mean by "mining taxes". The 32% inclues PAYE [paid by the workers]. As the then Finance D Minister Miles Sampa said in August 2012, "PAYE is tax paid by workers and when this is removed from their tax bracket, the mines contribute very little to the treasury". Miles Sampa was nearly correct. 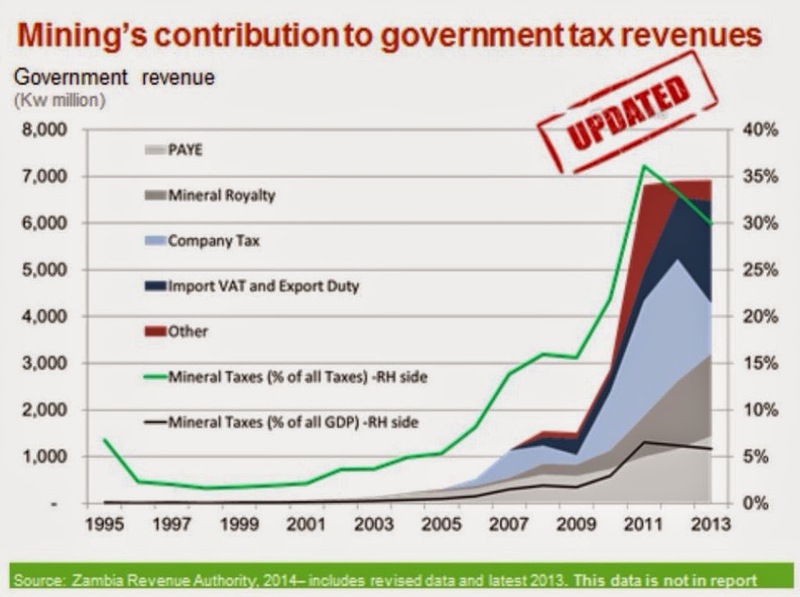 I say nearly because even if you include PAYE we are still getting less than 10% of total mineral export revenue. If you consider subsidies on electricity, no duty on fuel, large environmental impact, casualisation, etc, we look very foolish indeed. That is before you consider that our precious stones are not even taxed properly or controlled. And of course profits are kept abroad. We are losing out big time. As things stand it is certainly more money in foreign pockets. 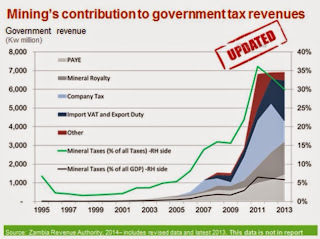 As this chart shows the "mining rent" to Zambia or the pure mining taxes are just 8%. The rest are ordinary taxes every company pays. This is a travesty. We have some of the most precious minerals in the world and we only get 8% for owning them. Unfortunately, every time someone reasonable raises a complaint we have a whole army of gullible journalists giving government poor analytical cover. Some journalists are on the books of mining companies to champion their propaganda. Clearly the light blue element, company tax, needs to be sorted out. The diagram should not include paye, as all companies pay it, as you said. I think I've said this much before as I went out of my way to do some research using the ZRA WEBSITE (before they took the figures down...what were they worried about?). The 2011 EITI Reconcilliation (which sadly works 3 years in arrears) clearly states that same mine paid 60% of all mining taxes, 22% of all taxes in that year. What the mines pay in taxes as a % of their revenue is a function of their profitability – but given that even those who are breaking-even are paying 6% royalty, PAYE, import duty, fuel levy, etc. it can’t be too bad a deal....but don't trust me...look at the relative taxation regimes in Zambia against the "Rest of the World". Wood MacKenzie in their recent "Changing Mining Policy - additional future development risk" recently placed Zambia at bottom of the Competitiveness vs Effective Tax Rate rankings along with Kazakstan....Kazakstan I ask you?! Zambia is rated below: Poland, USA, Brazil, Peru, Mexico, Australia, DRC, Russia, Chile and Canada ie all the main mining nations. As I've pointed out on this erudite blog many times before: all we need to do is enforce the tax regime that's in place rather than keep thinking we need to change it - an unpredictable tax regime is the surest way to frighten the Foreign Investor. Once we get all the Mining Houses to respect what's already in place and pay their taxes then we will be in a better place.....then we can address the elephant in the room....where does all the tax revenue actually go? Has everyone followed the Anil Agarwal saga, where he insults the Zambian government and people and boasts about dragging $1 billion plus 0.5 billion every year (for 9 years, $5.5 billion total) out of the economy? This should be the end of privatisation. Lots of links to past Windfall Tax discussions, and Edith Nawakwi's description of how the IMF/World Bank strongarmed the Zambian government into privatising the mines, by repeatedly withholding loans until they did.